Many people believe that cats are very independent. They often don’t realize that cats can experience separation anxiety. However, cats are social and they do become attached to their owners. Many cats are anxious when they’re left alone. 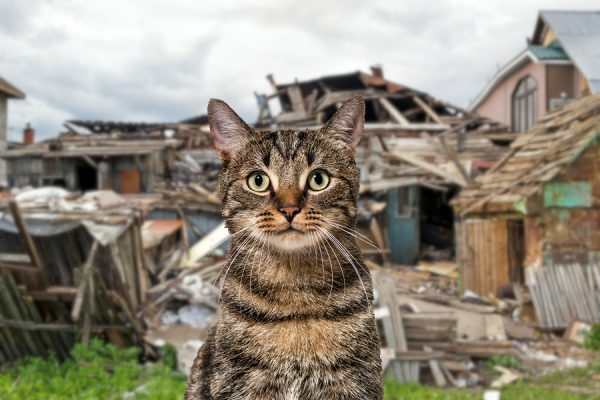 When cats become anxious, they often act out in destructive ways. They may act aggressively, knock things over, scratch doors and furniture, or urinate on your clothes or your bed while you’re out of the house. Destructive separation anxiety in cats has several potential causes. One possible cause of separation anxiety is genetics. Certain breeds of cats, such as Siamese and Burmese cats, are more likely to develop separation anxiety. Cats with a high-strung temperament are also more likely to experience anxiety. Kittens generally should not be separated from their mothers and siblings until they are at least eight weeks old. Cats that were taken away from their mothers too early as kittens are more prone to separation anxiety. Orphaned kittens are also more susceptible to the condition. Just like some people, cats dislike changes in their routines. A big change such as a move, a new baby being born, a change in your work hours, or even daylight savings time can trigger separation anxiety in your cat. Cats also pick up on their humans’ emotions. If you’re anxious, there’s a good chance that your cat will be anxious, too. It’s possible that your cat doesn’t dislike being alone as much as he dislikes being bored. Cats who don’t have enough activity will rely on you for attention and entertainment, and when you’re gone, your cat will feel lost without you to play with. Cats can develop depression and anxiety disorders just as humans can. If you think your cat may have separation anxiety, talk to your veterinarian. Your vet can make sure that the anxiety isn’t caused by an underlying medical problem, and may be able to treat the anxiety with medication. It’s important not to punish your cat for anxious behavior—this will only make the anxiety, and thus the behavior, even worse. Here are several steps you can try if your cat has separation anxiety. There are several behavior modification techniques that can help with anxiety. Only reward behavior that you want to continue. Cats who receive attention for clingy behavior will continue that behavior and are more likely to be anxious when you’re gone. Instead of reinforcing the anxious behavior, give your cat praise and attention when he’s quiet or when he’s entertaining himself. Practice your routine. Cats notice your routine and the little rituals that signal when you’re about to leave the house. The jingle of your car keys, the front door opening, or your putting on your shoes can make your cat anxious. Practice these routines throughout the day without leaving to desensitize your cat to these triggers. Pick up your keys and then put them down several times, for example. Walk outside for a short time, then come back, and gradually increase the length of the separation. Eventually, your cat will learn that when you leave, you’re going to return. Don’t make a fuss about leaving. While it’s tempting to spend awhile consoling your cat and reassuring him that you’ll come back, prolonged goodbyes let your cat know that your leaving is a big deal. Treat your cat the same way whether you’re leaving the house or just walking into a different room. Wait a few minutes to greet your cat after you return. If you treat your leaving like it’s nothing to worry about, your cat will pick up on it and may feel more relaxed when you’re gone. Cats may become anxious when they’re bored and do not have enough stimulation. One way to reduce separation anxiety and destructive behavior is to provide a fun and enriching environment for your cat. Set up a scratching post for your kitty. A scratching post will allow your cat to scratch and will protect your furniture. Place it where your cat enjoys spending a lot of time. Setting up multiple scratching posts in different parts of your home gives your cat a way to keep herself entertained while you’re away. A vertical scratching post is the best option. While you can purchase horizontal scratching posts, cats generally prefer a vertical scratching post. Install a cat tree for your cat to climb. Cats feel safe when they are in high places. Place the cat tree near a window so your kitty can watch what’s happening outdoors. Set up a bird feeder in your yard and allow your cat to watch the birds from the window. Provide an assortment of toys and puzzle feeders for your cat. The more toys your cat has to choose from, the better. Rotate different toys often so your cat doesn’t become bored with the same ones. If there’s a favorite toy that your cat especially loves, save it for times that you’re away. Try leaving the TV or the radio on while you’re away. Choose a radio station that plays relaxing music, such as classical music or jazz. Set the TV on a station that shows nature programs during the day. You can even purchase DVDs made especially for cats. Spending quality time playing with your cat is important for reducing separation anxiety. Play with your cat for at least 10 minutes every day. Have multiple play sessions with your cat whenever you can. Play with interactive toys or try teaching your cat a few tricks. If your cat becomes destructive while you’re away, try keeping her confined to one part of the house. Make sure she can access her food, water, litter box, and toys. Doing this will keep any damage limited to just one area of your home. A pheromone diffuser such as Feliway may help to reduce your cat’s anxiety. Place the diffuser in the area where your cat spends most of his time. If your cat’s anxiety remains high and she continues to be destructive, lodging her in daycare may provide a solution. Daycare will provide your cat with a fun environment where she’ll receive attention from trained staff and can spend time with other cats. Your veterinarian can give you helpful suggestions for treating your cat’s separation anxiety. Talk to your vet if your cat’s anxiety does not improve after trying the above suggestions. If you think your cat may be suffering from separation anxiety, contact us for an appointment.